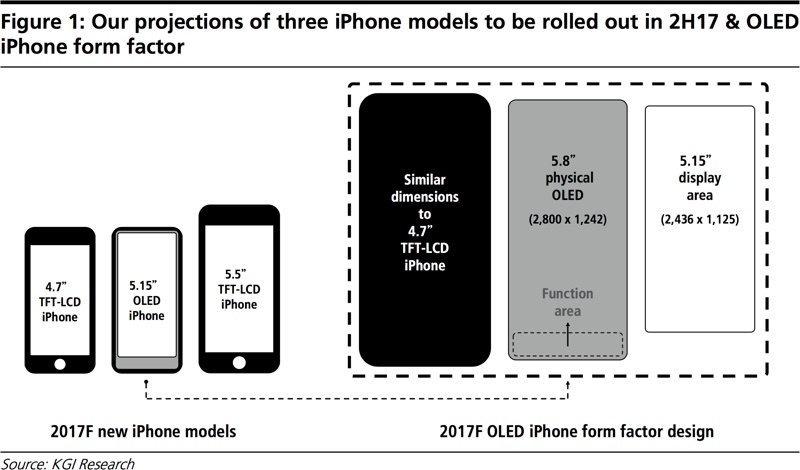 Back in February, noted analyst Ming-Chi Kuo laid out his expectations for the display resolution on the so-called "iPhone 8," a brand-new iPhone scheduled for release later this year that forgoes the traditional Home button and LCD screen in favor of an OLED display that fills essentially the entire front of the device. Working from his expectations, we believe we are seeing increasing evidence of iPhone 8 devices visiting MacRumors. The numbers are unsurprisingly extremely low, but what we're seeing matches what we'd expect from Kuo's resolution claims. It has also become consistent enough that it's increasingly unlikely these data points are fakes or one-off blips in our analytics. According to Kuo, the iPhone 8 will feature a 5.8-inch display, but with a strip along the bottom of the display reserved for a "function area." Details on exactly what the function area will be used for are unclear, but it will likely be some sort of dock-like area that could include fingerprint sensing, Home button functionality, and likely other dynamic icons and buttons for interacting with the device. While Kuo says the overall 5.8-inch display will have a resolution of 1242 x 2800 pixels, he claims the active "display area" will measure 5.15 inches diagonally with a resolution of 1125 x 2436. That's likely the screen size that would be presented to Safari and other apps as the usable display space. Ever since the release of the iPhone 4 in 2010, Apple's Retina displays have used pixel doubling or tripling to increase the sharpness of text and other elements shown on the screen. For example, the iPhone 7's display has a native resolution of 750 x 1334, but it presents itself as a device running at half of those numbers in each dimension, or 375 x 667. This logical resolution, known as points, keeps screen content at reasonable sizes but with four pixels making up each point, thus allowing for increased sharpness. Apple's "Plus" sized iPhone displays with native resolutions of 1080 x 1920 are a bit more complicated, presenting themselves as devices running at 414 x 736 points but in "3x" mode so that a total of nine pixels would be used to make up a single point on the screen. This multiplication factor yields a rendered display resolution of 1242 x 2208, which is then scaled down to fit the actual 1080 x 1920 display. With iPhone 8 models having been in testing for many months now and production likely to start ramping up soon, it's likely some of these devices are being used to browse the web, and every once in a while one of them may visit MacRumors. Checking into our analytics, we are indeed seeing some activity from devices reporting themselves as having displays of 375 x 812. Aside from a couple of visits last September, we didn't see substantial activity from devices reporting themselves with resolutions of 375 x 812 until March, and even then things were very sparse until late May when things began to pick up. Since June 1, we've been seeing anywhere between one and four visits from these devices nearly every day. All of them are also reporting themselves as running iOS 11.0, which is both unsurprising and reassuring, given that the iPhone 8 will undoubtedly ship with iOS 11 as its operating system in the fall. A handful of the visits came from IP addresses controlled by Apple, but even those coming from other IPs are localized to Cupertino or nearby cities of Sunnyvale and San Francisco when such data is available. The number of visits we've seen from these devices is extremely low, totaling roughly three dozen sessions. We do on occasion see strange resolutions being reported by devices in our analytics, but the regularity with which we're seeing this resolution pop up suggests that this is likely a real device. The 375 x 812 resolution is also the only one we're currently seeing appear associated with iOS 11 devices that can't be explained by an existing product. We similarly saw devices reporting a resolution of 834 x 1132 over a period of months leading up to last week's launch of the 10.5-inch iPad Pro, which corresponded to the 1668 x 2224 Retina display that was rumored for and ultimately appeared on the device. Apple is expected to unveil the iPhone 8 and more traditional "iPhone 7s" and "iPhone 7s Plus" models around the usual September timeframe for iPhone updates, although rumors have suggested supplies of the iPhone 8 could be extremely tight for up to several months after the official debut. A taller display, you say? I'll just leave this here. Gotta love MacRumors memes from 2012 and the iPhone 5 days! Remember when 800x600 on a 17" desktop display was considered luxurious and beautiful? I can only imagine where we will be in about 20 years. Aging 1080 P display? I know right... I mean I can't believe the iPhone 7 Plus uses a 1080 P display. It's so outdated and why would anybody want that? It doesn't have enough pixels. /S. Stop making the iPhone LED display sounding like it's horribly dated, it's not and it looks great. That's not a iPhone 8. this has been gone over many times. Please stop browsing MacRumors on your prototype iPhone 8s, we're supposed to be doubling down on secrecy! PS Has anyone seen my prototype iPhone 8? I haven't seen it since I went to that bar last night. Nope, that's a whole different story. Data about the device, OS and resolution need to be transmitted due to displaying the right format e.g. Special mobile versions of the site. Everything they said was true, people just misconcieve things. The maximum a human eye can see from average using distance. If you bring the device an in to your eye, you will need much more than a 1080p display to saturate the eye's bandwidth. No where did Apple say 'Retina is the max a human eye can see'. Cue the that's what she said comments.